In Defying the Odds, we discuss the tax issue in the 2016 campaign. 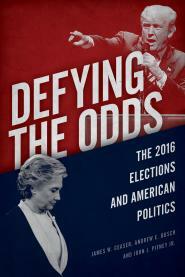 The update -- just published --includes a chapter on the 2018 midterms. and explains why the Trump tax cut backfired on Republicans. No wonder the 2017 Republican tax cut remains so unpopular — the vast majority of Americans don’t think they got one at all. As the annual IRS filing deadline of April 15 approaches, just 17% believe their own taxes will go down, the NBC News/Wall Street Journal Poll found. By contrast, 28% believe they’ll pay more, 27% expect to pay about the same and 28% don’t know enough to say. That helps explain why the tax cut provided so little ballast for the GOP as Democrats recaptured control of the House in November’s midterm elections. Pew Research polling last month found that the tax cut remains underwater politically, with 36% of Americans expressing approval and 49% disapproval. In reality, 8 in 10 Americans stood to receive tax cuts in 2018 under the law, according to an analysis by the nonpartisan Tax Policy Center. Yet the cuts for most taxpayers are so small that many didn’t notice.